As of August 26, 2010, the WB1GOF port C VHF/2-meter D-Star repeater was brought online. As of April 3, 2010, this is now a D-Star repeater. sales. Those proceeds are used to offset some of these costs. D-Star VHF repeater to the existing D-Star UHF machine that was recently converted. There also plans for putting a 900 MHz repeater on the air. improve them for your continued use. 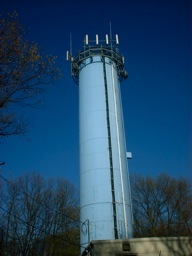 Westford water tower. Home of the WB1GOF repeaters.